I told you that it would only be a short while until I reviewed the next Sonic comic right? Well, volume 5 is here and it’s time to see if this volume could top the last one. There aren’t any real big milestones compared to the last one, but Scourge returns. I’m almost 99% confident that this is the same Scourge thanks to the design and the fact that it is the Dark Sonic who raced with Sonic a while back. Needless to say, the comic doesn’t disappoint and it’s a fun adventure. I already mentioned it, but one of the big comics here involves Scourge. Mecha Eggman has taken over a universe so that world’s Sonic goes to the main planet to get some backup. Sonic is happy to help and kindly offers his services, but little did he know that the threat would be so real. Sonic enlists the help of hundreds of other Sonics including Wolverine Sonic and Batman Sonic. The classic Eggman also arrives to help since he can’t have anyone else conquering the universe before him. 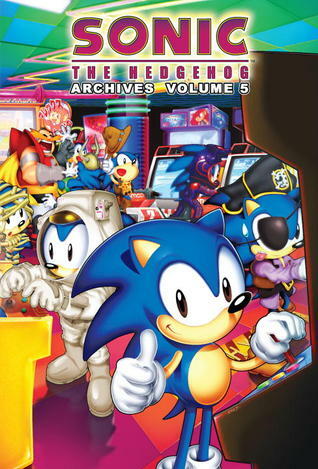 It’s a fun adventure and the stakes were certainly much higher than the average Sonic comic during this time frame. Another big comic was the Death of Sonic. Sonic was caught in a big explosion and the other Freedom Fighters mourn his loss. Tails knows better of course, but the others decide to attack Eggman. Tails tags along and now Sonic must save his friends from utter destruction. Does Sonic have what it takes? Also, this collection brings a never before seen story where Eggman uses a Universal level Salamander to attack the team. He easily takes on the whole Freedom Fighters gang and the heroes realize that they will not be able to defeat the menace. They must use their brains instead of their brawn this time. Speaking of giant opponents, there’s also a big robot. I forgot the exact name, but it’s a parody of King Kong and this guy means business. He punches Sonic clear out of view and kidnaps Sally. It’s a tough monster to be sure, but still no match for the teamwork that the Freedom Fighters bring to the table. It’s never a good idea to mess with the heroes eh? There are a pair of mini stories with Sally, which end with cliffhangers that don’t go anywhere. One of them has a Crystal Ball, which Sally considers using to make her life perfect. Another one has Sally infiltrate an Eggman base and blow it up, only to come face to face with the leader of British Intelligence. There was also a comic where Sonic and Sally decide to hold a play where they get married and the world lives in peace. You get the jist of the stories from these and I mentioned most of them. There’s nothing quite as dramatic as the debut of Knuckles, but the return of Scourge is fairly important I suppose. The collection brings 4 main comics, which is the norm, but the bonus issue at the end helps to make the collection a tiny bit bigger than the last one. It’s still a quick read though and you will be through it in no time. The art is essentially identical to that of the last volume’s so it is still quite good. I’ll never tire of this retro style as it is simple and straight to the point. All of the illustrations hold up quite well and a casual glance at the page is all that you will need in order to figure out what is happening. It simply doesn’t get better than that folks and while the new Sonic art style may still win, both old and new Sonic comics look good. The cast of characters is just as solid as they were in the last volume. It’s fun to see all of the cameos from various other forms of media like having the Bat Signal appear or making a Wolverine Sonic. Sonic The Hedgehog is still the best character in the series as he always knows when to put out the stops and start the puns. His unwavering confidence in all circumstances is why he is still known as one of the strongest characters around. The rest of the Freedom Fighters are fun to watch as well and Eggman still makes for an interesting antagonist. Unlike the last graphic novel, the enemies here were actually able to make Sonic take the battles a little seriously this time. Sonic was actually being defeated by the King Kong rip off as well as the giant lizard. Is Eggman slowly starting to figure out how to overpower Sonic? In later comics, Eggman admitted that he could have destroyed Sonic and the Freedom Fighters at any time. It’s fun to look at these comics and wonder if that was the case. Likely not as Eggman appears to be out of his depth, but with an army of over 4 million robots on his side, Eggman really shouldn’t have any difficulty dealing with the heroes. This is just one of the reasons why Sonic needs some more powerful allies. Bunny is a decent start, but we need more super powered allies if the Freedom Fighters ever want to truly take down Eggman. Overall, If you’ve stuck with the series until volume 5, chances are that you are here to stay at this point. You’ve made a good decision as the series is quite good and it is quality reading. You won’t find a better or more humorous story out there without really trying. It’s going to be a lot of fun to keep up with the Archives and to gradually notice the comics getting more and more modern. Once Shadow or any of the other Post Sonic DX characters show up, we’ll know that the comics have made it. All of the comics are fun and this is a good read from start to finish. It’s a title that I’d recommend to anyone and you won’t regret giving the series a spin. It is time to look at another Sonic Universe arc. Unlike the Journey one, this proves to be an epic of immense proportions. It is no exaggeration to say that this very well could be the greatest Sonic comic that I’ve read. That’s quite the feat considering that Sonic and Shadow don’t really get a role here. You will be on the edge of your seat for this story! 200 years from the current Sonic comics, Silver is still trying to find a way to save his future. All he knows is that a traitor from the Freedom Fighters will do something in the past that destroys his world. While he tries to unravel this mystery, Silver learns how to harness his abilities. Suddenly, an intruder breaks into his universe and attacks. Silver manages to defend himself and follows the opponent back to an alternate past where a demi god known as Enerjak rules. Enerjak has destroyed most of the inhabitants on the planet and now plans on ruling every planet in the multiverse. Can Silver defeat a being of unlimited power? Right from the get go, you can tell that this is not going to be your average Sonic adventure. For one thing, it’s a lot darker and more serious toned than the rest. The setting is a ruined city and only a few heroes are still alive. We really haven’t seen a Sonic comic that was this intense. Even my other favorite Sonic comics never had this much of a sense of danger. Now, the Silver Saga is fairly dark and intense, but it never goes overboard. Silver is still throwing around jokes through these turbulent times and the other characters contribute when necessary. It helps to prevent things from getting too intense and it is still in the usual Archie style so we get to have some incredible fights. I don’t think that I’ve seen any better fights in all of the Sonic comics either. Silver and Enerjak’s battle could pass off as a DBZ battle as they hurl islands at each other and land some tremendous blows during their fight. It is incredible and I remember a big Silver fan commenting on the blog years ago about how much cooler Silver was in the comics than in the games. I can’t deny that he is very awesome here. I liked him a lot in Sonic 06 as well, but this is certainly the definitive Silver. It almost goes without saying that the art is very good. The author does a good job of showing how different the alternate world is from the current one. All it takes is one small change and things can really go bad. Absolute power corrupts after all and it is one of the main themes in this graphic novel as the being who calls himself Enerjak was once a hero, but he was tainted by the powers of the Chaos Emeralds. Silver is the main character of course and this comic should help fans draw a lot of similarities to Trunks from DBZ. These two characters have always been compared as their back stories are very similar. I even found myself reading his lines with Trunk’s voice as a result and their personalities are more similar than I could have guessed. Future Trunks was a great character in DBZ so this certainly helps Silver’s case and it is safe to say that he has moved up the character ranks for me. He’s still behind Sonic and Shadow of course, but after that, he may just be a few spots away from them. I am certainly convinced that he is one of the strongest Sonic characters. Enerjak had the power of all 7 Chaos Emeralds and he was able to beat Super Sonic and the rest of the heroes. Silver wasn’t even using his Super Silver form and he actually had the upper hand against Enerjak. He remembers that he shouldn’t solve every issue by fighting and quickly changes tactics, but it is heavily implied that Silver could have kept on going if he wanted too. It seems like he has Chaos Energy within him and can access Chaos Emerald levels of power without actually possessing them. 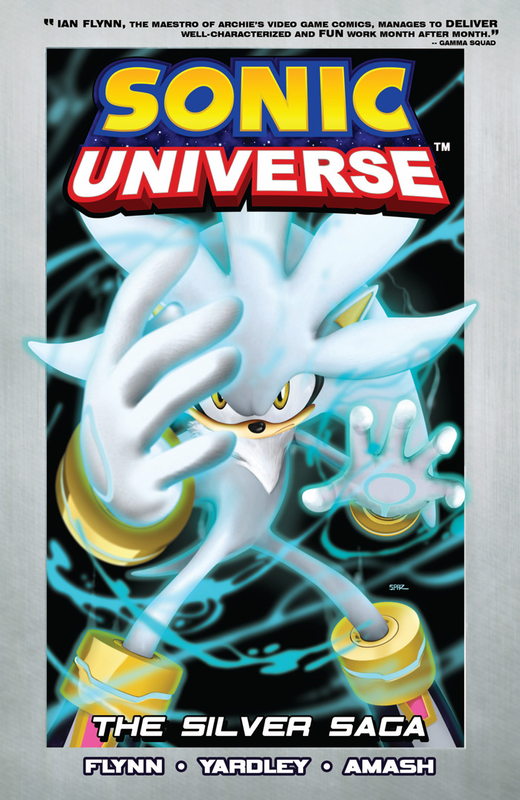 There’s a chance that Silver has unlimited power within him, which is being hinted and that would be really cool. He’s a lot like Superman as well since Silver always tries to find a peaceful solution and can take quite the beating. It’s just hard not to go on and on about how impressive Silver was. Enerjak made for a great villain as well. His design is really good and he did defeat the heroes. Upon destroying them, Enerjak stole their souls and uses them to power robotic copies. He never uses Sonic’s, which is too bad, but we see almost everyone else. The robots don’t have the original’s experience and ingenuity so they aren’t quite as lethal, but they are still powerful. Although, Enerjak doesn’t need them to fight. He can sink continents with ease and throw islands around. Enerjak’s power is unlimited as long as he possesses the Chaos Emeralds and he’s another top tier Sonic character. I would have loved to have seen his fight with Super Sonic as that would have definitely have been a lot of fun. I want to see Super Sonic take on foes like this as it has been quite a while since I have seen him. I am convinced that I may never see a Sonic comic that is this good ever again. The Silver Saga was simply exceptional. There is a cliff hanger which leads into the next Universe volume and that one should be fun, (The character gets a lot of hype as everyone could be in danger according to the cops!) but topping the Silver Saga is going to take a lot more than that. We’re going to need a Sonic and Shadow team up or something like that. Every series has an ultimate arc eventually though so I guess Archie finally got one. The scene where we see all of the fighters who Enerjak has defeated may be iconic at this point and it is when we knew that things would never be the same for Sonic and his friends. I’m also interested in seeing Silver continue with his plot to find the traitor. I’m wondering who it is and if the plot is still relevent with the recent universal shakedowns that have been happening. Hopefully Silver got to find him/her in time or his adventure will have had an abrupt end. Meanwhile, I can’t say that the new Freedom Fighters were terribly interesting, but they didn’t need to be since they just acted as distractions for Silver in this fight. They weren’t bad either, which is great since I can safely say that this comic had no negatives. It was just incredible and the ultimate Sonic experience. Overall, The Silver Saga is one adventure that I won’t be forgetting anytime soon. It really had just about everything that I could have wanted in a Sonic comic and I was not expecting it to be this good. It was amazing and felt like an epic arc that could have been in any show. I saw glimpses of the Justice League Unlimited Two Part episode, the Trunks special, and more. The idea of alternate timelines can still work. I don’t like when they get a whole movie or show about them that doesn’t seem to ultimately serve a purpose, but when it is similar to the original like with the Justice Lords, then there is more potential. This opens the door for good what if fights like Enerjak and Silver. This comic really had it all and succeeded in all areas. I highly recommend checking this out if you’re a big Sonic fan and especially if you want to see a dark Sonic adventure. Even if you’re just a comic reader, this is one of the best comics of all time so you should really check it out! Get ready for fights that will rock your world! This game has more of a “story” mode than the other title as the main menu is called World Tour. There is no plot or story, but you do have to complete levels to unlock the next ones and you go from world to world. So, it’s a story mode without the actual story. I always liked this kind of set up because it really feels like you got to complete the game after you wrap it up. No worries though, we’ve still got Grand Prix Mode as well. There are quite a lot of levels in World Tour mode so you’ll likely be here for quite a while. Depending on what difficulty level you beat the game on, you can earn 1-4 stars per level. That’s where the artificial replay value comes in. To unlock some of the final, extra levels in the last world, you must get a whole lot of stars. This means going back and doing a lot of the older missions on tougher and tougher difficulty levels. I thought that this was certainly a bit much, but for many fans that won’t be a problem. The gameplay is pretty fun after all so going back and playing the events again isn’t bad. Replaying the tournament missions is another story, but you don’t need to have literally every star to beat the final levels as far as I know. World Tour is also where you unlock a majority of the characters and mods. The more stars that you get, the more gates that you can open for unlockable secrets. It’s a nifty system and it always feels particularly thrilling to unlock a new character or custom mod. As I mentioned earlier, we also still have Grand Prix mode, where you can play all the stages as they were meant to be played. Time Attack Mode is a given and naturally, we’ve got the multiplayer option as well. There’s certainly a lot to do in this game so even without going back and doing old levels, you’ve got more than enough content here to warrant the 60 dollar purchase. Of course, you can likely get this game for a third of that at this point. The PS3 trophies to collect is also another piece of the puzzle to consider. I don’t plan on getting the Platinum here thanks to those tricky online trophies, but I got a decent amount of trophies before I put the game back on the shelf. Perhaps I’ll go back and get some more at some point, but for now I’m definitely satisfied. Each character gains exp when you race as them and you can work to max everyone out. I got Sonic to the final level as I used him for almost all of the World Tour events, but I didn’t get around to the other characters. It’s a nice incentive to make you want to play as every character. There’s even more things to do here that I haven’t touched upon so content is not a concern. As for the actual gameplay, it’s definitely more arcade styled. The game definitely lives up to the billing there and that will decide whether you prefer it to the previous game or not. I actually liked the style in the other game more, but they’re fairly similar and this one’s still a blast. This game does introduce two new features, which are the boat and plane gimmicks. You can transform during the race at designated spots, which results in a fun change of pace for the gameplay and you get to really zoom through the courses. Perhaps a little ironic, but I prefer the traditional car gameplay to both the plane and the boat, but they are still fun methods of travelling around. You can grab items as you go through the course and naturally, the goal is to get to the finish line first. That doesn’t sound too hard right? The A.I. is actually much better in this game than the previous one. I think it’s at a pretty good level. It’s tough enough that the levels are not a walk in the park, but it’s not too difficult that you will find it to be a little cheap. The controversial decision to make the computers input readers in Smash Bros was dicey as it is, but the computers here seem relatively fair. Just be prepared to bring your A game to the table for each round and you should be okay. Graphically, this game certainly looks stunning. You can instantly tell that this is a PS3 level title as all of the details look flawless. Sega spared no expense for this title and you can tell that it came out back when Sonic was still a prominent figure in their plans. All of the levels are crisp with a great amount of detail and the oceans look especially good. You will certainly miss the graphics once you turn your TV off. Audio wise, the game fares just as well. The stage themes are nice and cheerful, while also being fast enough to keep up with the gameplay. Sonic’s themes are typically the best by far, but we also get some more opera styled themes for the final levels. As this is a cross over, you can expect music from other games as well. While I know all about Monkey Ball’s themes, the rest of the series are all new to me so hearing their music is always fun. The city levels tend to have some really fun themes to listen too. After a lot of thought, I do think that the first Sonic All Stars Racing game beats this one. At least, in terms of gameplay. That being said, it certainly loses in just about every other area and it can probably be tough to go from Racing Transformed to just Racing. The first game simply doesn’t look quite as good and there are less guest star racers in that game. Pure gameplay is typically what counts the most so the older one still takes the lead, but Transformed is certainly on the same level and deserves the hype that it has gotten. Now, if only they could throw Mario in the game so that we can call it a crossover! 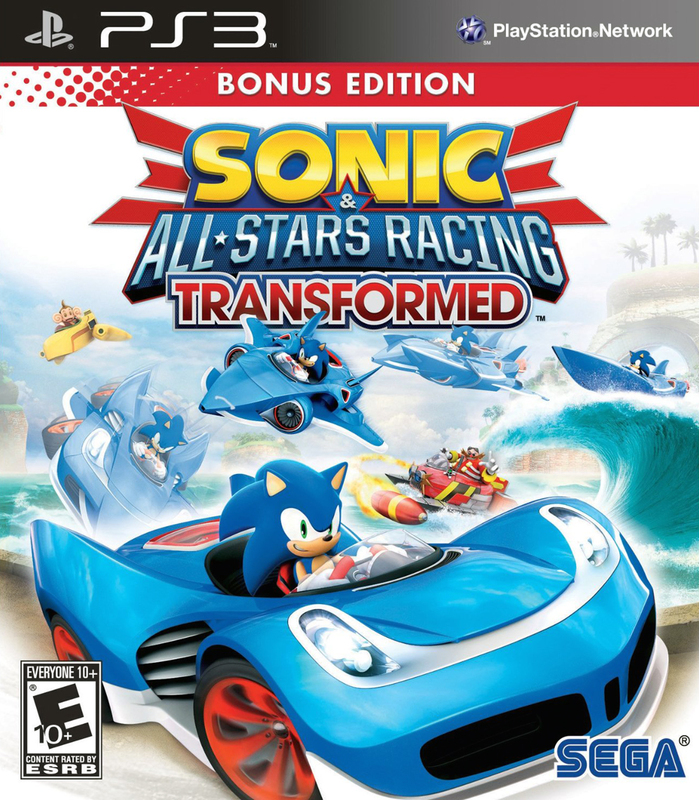 Overall, Sonic & All Stars Racing Transformed is a great follow up to the first game. The racing is as fun as ever and the graphics are intense. Aside from racing, some of the events will have you fight other racers or even dodge traffic. Dodging traffic is always a lot of fun for me and it’s easily one of my favorite events in the game. If you plan on doing everything that there is to accomplish here, you should be prepared to spend a lot of time playing this game. It’s certainly worth the money and I can only hope that Sega decides to make a third game to finish up the trilogy at some point. Sonic has definitely proved that he can hold his own racing title and Mario Kart has a legitimate rival now. I definitely recommend buying this game when you get the chance! I reviewed the Wii U version of Sonic Boom not too long ago. Despite the bad press it was decently good. It wasn’t great, but it was a fun Sonic game. Now it is time to see how the other half of the Sonic Boom game franchise fared. I can safely say that it held its own against previous portable adventures. The game starts off with a bang as we see Amy dueling with Lyric. The Reptile manages to get the upper hand when Amy stops fighting to talk to Sonic over the communicator. He wants the Shattered Crystals and nothing will get in his way this time! Sonic quickly gathers up his three trusty allies (Tails, Knuckles, and Sticks) and heads off for his toughest challenge yet! Timeline wise, this game seems to act as an alternate version to the Wii U title. We fight Shadow again because he is brainwashed and Metal Sonic joins in on the fun too. Amy is kidnapped so there are a decent amount of differences to be found, but many parts will make you think of it as the Wii U game. I give Sega kudos though for giving us a different game instead of a normal port for the 3DS. The graphics are decent, but they aren’t as impressive as they could be considering that this is a 3DS game. The environments are pretty fun and the gameplay is actually pretty quick, but the camera can keep up. This area may still be a little underwhelming, but it could certainly be a lot worse. Shadow always looks cool no matter how the animation turn out. That being said, there are only 2-3 animated cutscenes in the game. The animation looks pretty good for those, but the rest of the events are all text based, which shows just how limited the budget was. Little thing like the fact that you can’t speed up the slow moving text during a scene will become noticeable over time. The gameplay is pretty good though and I definitely can’t fault the game there. There are no real glitches to be found and it plays out like most other Sonic portable titles. One difference is that the characters have electro whips so that you can jump over large areas and disarm enemies. I never use it for the latter effect, but it is mandatory for the jumps. I am okay with it, but it is not really necessary. The game could have done just as well for itself with or without the item. Knuckles can dig, Tails can glide, and Sticks can fire a boomerang. These abilities help you progress through the level, but you will still want to play as Sonic for the majority of the game. He is just the most fun to play as! One mechanic that I felt was utterly pointless was the gate system. You definitely do not need that to be in the game and it is just an excuse to get your stylus out. You simply swipe down to go from area to area, but you could have just done that with the push of a button. It’s not a huge thing, but it just makes you wonder. There are several gates in each level and they can also be found in the stage select menu. The soundtrack is pretty uninspired and I couldn’t really recall any of them right now. They are pretty decent while you are playing, but that’s about it. I miss the good ole days of Sonic Adventure 2 Battle and Heroes. Now those games had some really good tunes to listen to during the stages. As it stands, Sonic Boom could certainly do worse though. An interesting thing to note here is that there is only one boss fight in the game. it’s your big battle against Lyric of course and it’s a fun final boss. It doesn’t have the scope that the others typically have, but I was just glad to have a boss fight. It’s a hybrid of a racing level and a boss fight as you chase after Lyric until he turns around to fight. Then you chase him again and repeat the process. My only complaint with the fight would be in how everything is repeated. You do the same things three times in a row so the actual boss fight is around 7 minutes, but it could have been much shorter. He doesn’t even switch his attacks as he can only fire a laser, shoot a rocket, and try to hit you with his claws. Memorize the 3 attacks and you’re all set. If anything, the speed part of the level is the dicey section. The other “bosses” don’t get to fight you in battle. Instead of confronting Shadow and Metal Sonic, you just race against them and the loser automatically self destructs or flees the scene. I’ll admit that this was more than a little disappointing, but I do like races as well. I just would have liked to have had a race and a boss fight. As mentioned earlier, the game seems to really have a set up that is very fixed. Meaning that each world has the same levels more or less…or the same kind of level. Naturally, we have the race level. There is one per world. Next up, we have the worm races. 1 of these is featured in every world. These are only about 2 minutes and they feel more like a minigame than anything else. They’re actually pretty fun though and it’s a great way to train your reflexes. Finally, we have the platforming levels. Typically there are 2 of them per world. They’re the longest ones and they can easily take you over 10 minutes to complete the first time around if you’re not careful. They’re pretty good although I prefer the races and the worm rushes. This is one of those games where you will really want to keep an eye on the collectables. The game forces you to get at least 30 of the 34 Emblems in order to face the final boss. So, you’ve got to get just about all of the crystals and screws to beat the game so you may as well get the final few right? We ended up with just about 100% completion as there are just a few medals left to get. The big secret for doing this is that you get to go to Amy’s house and watch the heroes dance. It’s not exactly as good as the bonuses that you used to get in the Sonic games for all emblems. (Sonic DX all emblems = Metal Sonic; Sonic Adventure 2 Battle all emblems = Green Hill Zone…etc) It almost felt like the game was mocking us..maybe the developers just wanted to have a little fun with that. So, naturally the collectibles represent some replay value for the game. Getting all of them should buy you a little more time and then you can spend your medals at the shop to get titles and other things. There’s also a few pages of a comic to read that provides us with some backstory for the game. It’s good that these things are here since this would otherwise be one of the shortest Sonic games ever. You can probably beat it in a day or two if you put your mind to it. There are only about 21 levels and since you can beat over half of them in about 2-4 minutes…that’s not a whole lot of play time. The bulk of it will enter once you have to replay all of the levels to find what you need. I recommend seeking them all out with the map right away…so upgrade the map to its fullest potential at your earliest convenience. Sonic and his friends are in their Boom interpretations so you should know what to expect from the rumors. Sonic is still really fast and confident. I dare say that he is one of the only characters to really not have changed that much in this series. He mocks Shadow a lot, but you can argue that he would have back in the olden days as well. He’s still a very likable character and it’s hard not to root for Sonic. Tails is also true to form and he’s still the genius of the group. His teammates don’t always appreciate this, but Tails isn’t afraid to put them in his place. The other characters are a little more changed like Knuckles. He has really lost a lot of intelligence so that he could become the punchline for just about every joke. He has trouble forming proper sentences and you probably haven’t seen a character this unintelligent in a very long time. It can be a little painful to watch for longtime Knuckles fans. Since this is practically a parody it’s okay, but I can only imagine that it’s similar to what Pac Man fans felt when they watched the new show. Amy is more independent in this version and they try to hammer that in (See what I did there?) by having her give Lyric a good battle in the intro. She’s actually winning, which is sad for the villain, but she let her guard down, which was a pretty huge mistake in the long run. She seems pretty cool here and her character trope is better than the other allies for me. Sticks got so much attention before the game came out, but it seems as if the franchise has forgotten about her. The TV show is the only place where she really gets to get some character development as the games try to tell you that you should already be familiar with her character. She’s known as the nutty raccoon in the forest who is paranoid and that’s basically her personality. I like the fact that she’s basically crazy and admits to this, but she really doesn’t add much to the group. We may as well have just stuck with Marine. Eggman is surprisingly absent from the game. He just doesn’t make it and that’s rather odd. Metal Sonic is here, but he has no character and he’s just obliterated on arrival. Shadow’s role is similar to the Wii U version in the fact that he just attacks the heroes for the lolz, but he actually isn’t doing it out of free will here. He was thoroughly defeated by Lyric earlier so now he is being mind controlled. The heroes save him and he storms off until the very ending where he has his big moment. It’s pretty satisfying for his fans so I’m glad that the game had a strong ending there. Lyric is still not a likable villain. He’s not bad by any means, but he’s ultimately generic and you have to wonder how he is a threat to Sonic at all. He has a tail to attack people with, but he’s slow and not all that strong. I wouldn’t be surprised if Lyric never appears in any of the games outside of the Boom series. Maybe he’ll be in the next Sega racing game…maybe. 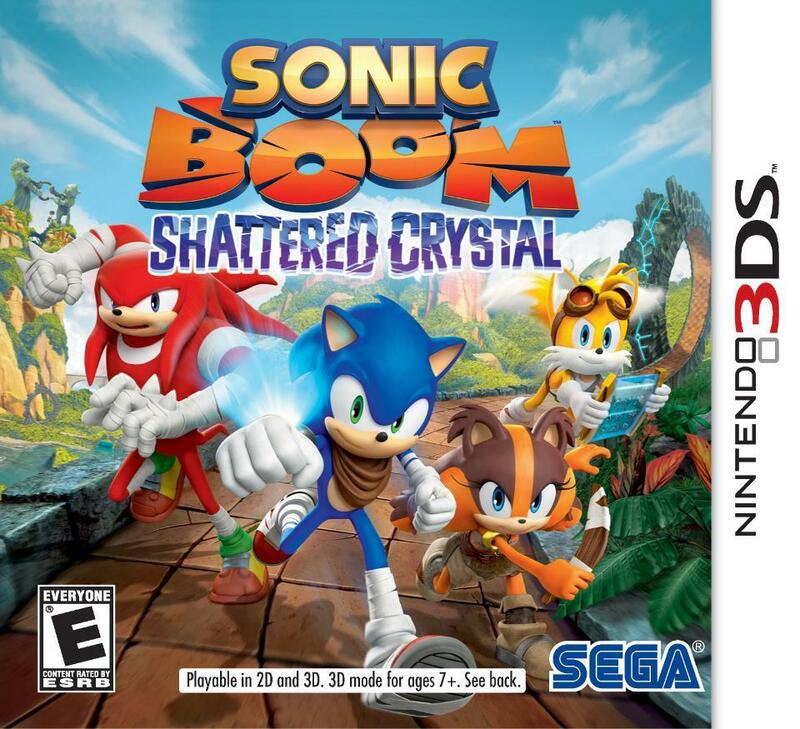 Overall, Sonic Boom Shattered Crystal was a pretty fun game. I’d say that the game was a little better than the Wii U version. It felt more like a traditional Sonic game and it stayed fast paced from start to finish. Shadow looked a lot better here as well, which is a plus and the moral at the end was pretty intense. Sticks finally put two and two together and she came up with the logical outcome. The gameplay is pretty tight and it definitely doesn’t shame the Sonic name. I highly recommend checking this title out and don’t trust the rumors that it is super buggy and glitchy. The Wii U version had a little trouble with that, but it was also exaggerated on that account. The only reason why you may want to be wary of getting this game is the short length, but the game has already had a price reduction in several places so it’s certainly worth the price. Even at 40, a short, but fun game is always worth it. Take the plunge and pick this game up while it’s still new. You won’t regret it! It’s time to review a PS3 game that I’ve had on the backburner for quite a while now. This is a game that I got for 5 dollars at Gamestop and that’s always a pretty good bargain for a game. We can’t underestimate how good a PS3 Sonic game can be after the big one in 2006. So, I stepped into the game world and witnessed some great gameplay, but a story mode that left much to be desired. See, the “story mode” in this game is called Superstar Mode. Instead of making it your typical career mode like in most tennis games, this one was totally made up of minigames. That’s strange right? It may be appealing for a little while, but there are so many levels in Superstar mode that it can get tedious. There is the occasional match or tournament, but mostly your tasks include things like: Shoot the balls into the portal, Shoot the moving objects, Shoot the ground to alter the path, etc. Minigames can be fun because they are short and sweet as they distract you from the tough story mode. The point is lost when there is no main mode. There is a separate tournament mode in the game, but it’s more like Super Smash Bros’ tournament mode. So, Superstars mode wasn’t really that enjoyable for me. It definitely could have been handled a lot better. The cast of characters isn’t very impressive either. There are around 20 characters in the game and you typically expect a little more than that. Mario Power Tennis had a similar amount and that came out many years ago. (Of course, it was on the Gamecube so that could explain why it was so great) The cast isn’t terribly important since everyone will want to be Shadow or Sonic, (Or at least, I always want to play as them) but more options would have been preferable. I guess Sega didn’t want this to be thought of as Sonic tennis in the end so they quickly stopped themselves from adding more of them. Otherwise, Metal Sonic would have been a pretty great addition to the cast. The gameplay for the main games is essentially the same as Virtua Tennis. (Which is a very good thing) I assume that you are familiar with the rules of tennis. After that, you really have a good understanding of the gameplay. Each character has a super move that can be used once in a while. Sonic’s allows you to transform into Super Sonic. You gain a lot of speed and all of the balls that you hit will gain a pretty mean spin. It’s important to lunge for those balls right away since they can be impossible to hit once they really get going. Sonic’s super attack is pretty cool, but I’m not familiar with most of the others. I typically finished off my opponents before they could use theirs. I definitely find the gameplay to be pretty enjoyable. It’s a lot more technical than Mario Power Tennis and that can be a good or bad thing. There are definitely pros and cons to both styles. This one is more realistic, but you could really feel the power behind the blows in Mario Tennis. I’m a pretty big fan of both types of gameplay so I’m fine either way. Tennis is likely second to Football when it comes to sport gameplay. The graphics are decently good. The character models look pretty great and almost as if they were ripped from the 2006 game. They were definitely very well done..at least for the Sonic characters. Others like Alex The Kidd and Nights didn’t look quite as good, but they were good enough. The backgrounds and effects were pretty standard. Not bad though and you could still tell that you were playing a PS3 game. I suppose that’s all I can ask for from a sports spinoff anyway. The themes in the game are decently catchy. I found them to be a little limited, but it sounds pretty good when you’re actually engaged in the matches. Again, I would say that it was pretty standard. Perhaps I’d give it a 6/10 at the most. The soundtrack gets you in the mood to play tennis and that is the main goal for the soundtrack. In terms of replay value, Sega Tennis does a fine job. It’s mostly be default since it is a tennis game and it has a multiplayer option. Playing against someone else will always be fun in this style, which is why I say that this game has replay value. Otherwise, there really isn’t much to do once you beat Superstar mode. The computers will become pretty easy for you at that point and there is nothing else to unlock. If you don’t have anyone to play with, then I would consider this game to be more of a 6. (Or a high 5) It should also be noted that this is one of the games that came out before the Playstation 3 began to add trophies to every game. That also takes away a chunk out of the replay value. Overall, This game is not going to last you for a very long time. The counter says that it only took me 2h:30m to beat the game. It definitely took me longer than that, but I guess the loading times really add up. The only way that this game will help you in the long run is if you take the game up on its multiplayer option. Superstars mode can only last for so long after all and it’s not very enjoyable. The rest of the game is pretty solid though and the gameplay is the important part. The game is currently going for less than 5 dollars so that’s also a good reason to go for it. I would recommend Mario Power Tennis more than this one so I have to give Nintendo the win this time. 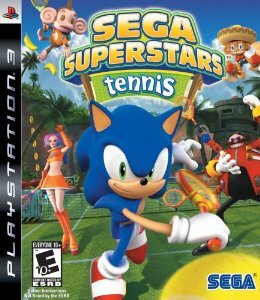 There’s no reason why Sega cannot improve though so I’m looking forward to their next tennis game. It’ll be fun to compare the racing title to Mario Kart as well someday. 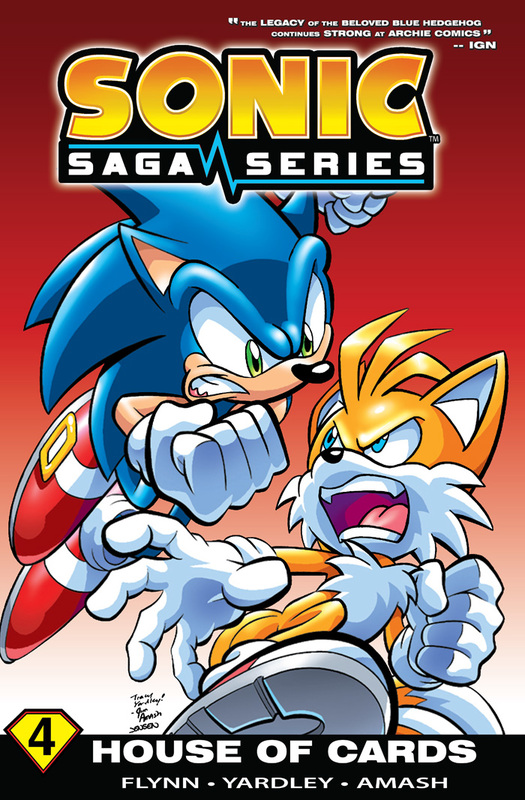 Well, the legendary Sonic Saga Series continues with this electrifying volume! To be frank, this volume wasn’t quite as exciting as the last few, but it was still pretty fun for the most part. I definitely preferred the first half, but the cliffhanger definitely hints at cool things, which are to come. We will see if Sonic has what it takes or if he will be quicklu defeated by this threat. The first half concludes the big Eggman event. Eggman has followed Sonic and his pals to their new home. After Sonic was casually crushed in their first encounter…does he really stand a chance!? He hasn’t gotten any stronger after all and he’s still pretty fatigued from their last bout. Luckily, Sonic has a plan, which may turn the tides against Eggman and his army. It’s going to have to be a doozy at this rate! The second half is mostly an arc to help you pick which side you’re on. Team Sonic or Team Tails. It’s a clear choice right from the get go as far as I am concerned. Tails looks pretty bad for the entire volume, but more on that later. Tails’ (shady) parents have decided that the place needs a new ruler and they want the King to step down so they create a mob and attack the castle. The King arrests the parents, but Tails helps them to bust free. While the parents go to dispose of the King, Tails stays behind to take Sonic down. Sonic is going to have to choose between the country’s safety and his friendship with the kid in this big climax. How did it come to this!? Sonic is the main character and that’s how it should be in a Sonic collection. He does pretty well throughout and it reminds me why I’ve always been a fan. One part that I didn’t care for was Sonic’s resolution against Eggman. In the end, Sonic basically admitted that he couldn’t win. He did get wrecked during their first battle, but I like to think that Sonic would find a way to use his speed to his advantage and secure a win. Let’s face it, if it is to be it’s up to me Sonic will always be able to crush Eggman’s robots when the going gets tough. The other part would be the ending to his battle with Tails. He’s being nice to Tails of course, but the stakes were decently high so I’m not sure how great that was. If something had happened…well, it would have been very dicey for Sonic. The whole issue wasn’t really his fault at that point. Nontheless, Sonic definitely did well in these issues and I look forward to seeing how he’s going to deal with the next threat. The Sonic comics definitely wouldn’t be the same without him since Sonic provides most of the laughs. Well, Tails definitely goes through a lot of character regression in this volume. They’ve been hinting at it for a while now so it’s not like the issue came out of left field. Unfortunately, everything finally blows to the surface in the comic as Tails has his big fight with Sonic. Now, Tails is doing all of this to break his father out of prison, but the guy deserved to go there. He organized a mob and basically made everyone crazy. Tails has to realize that justice must come over his personal feelings at times. Sonic naturally arrives to stop Tails from making this mistake and the fight begins. It should be noted that Sonic is trying not to fight Tails, while Tails is getting in every cheap shot that he can muster. It’s definitely not a very effective way of accomplishing things. We also find out that Tails is mostly mad at Sonic because of the whole Fiona incident. Tails should have spoken up about it sooner and it’s not quite as serious as he makes it out to be. Romance should never come before justice and teamwork. Tails talks tough to the end, but I can’t say that I liked him at all in this volume. Hopefully, he will put this behind him and become a better Freedom Fighter for the next collection. Eggman returns after his big victory in the last volume. He continues to explain how he has been toying with all of the heroes up til now. Even as he leaves, he explains that the heroes are basically doomed when he comes back to get them. He doesn’t really get to have a rematch with Sonic in this volume since a few others decided to jump in. It was short, but Eggman’s big run is already over. The collection ends with him making a truce with the Freedom Fighters so that they can combat the next menace. Eggman still makes for a solid villain and he’s much better than how he looks in the video games. At least, the newer ones. He was pretty decent in Sonic DX and Adventure 2 Battle. I would argue that he went downhill from there with the exception of Shadow The Hedgehog. Scourge and Fiona only get a small cameo. They’re mostly just here to show us how powerful the new villain is. Hopefully Scourge has another fight with Sonic coming up and Fiona will likely toy with the heroes’ emotions for a while. It’s what she does best after all. Again, the next volume sounds pretty intense! I personally blame Snively the most for the fact that Eggman didn’t win this round. He had an army at the ready so blowing up the forcefield should have been extremely easy. Not accomplishing this feat was pretty embarrassing at best. I’ve never really cared for Snively no matter how emotional they try to make him. He’s still more of a two bit villain and I don’t see that changing anytime soon. It should also be noted that there is a mini comic at the end about how Sonic met Tails’ parents. They were a lot nicer back then and they didn’t have so many hidden agendas. The times have changed them as they have changed many of Sonic’s friends. Luckily, Sonic’s held himself together all these years…that’s why he’s known as one of the greatest heroes of Mobius! This story was all right, but nothing really noteworthy happens in it. The artwork in the collection is as solid as always. We don’t get any real dramatic moments like the last volume and things aren’t quite as serious. This means that we can’t test the artwork as much as we may have wanted too, but it still looks solid for the characters and action scenes. Archie definitely knows how to stay consistent. One big criticism that I had with the first part was that Eggman’s army probably should have won. Sonic and Knuckles were the only two heavy hitters left and Eggman proved to be more than a match for Sonic. With the power of friendship, the heroes manages to prevail, but it was still a little hard to really believe. Snively not being able to penetrate the barrier with all of his warheads was also hard to swallow. No matter how you slice it….Eggman should have won this battle. He came in with the better plan and the better tech. Better luck next time I suppose. The resolution to the other part was also a little suspect. Tails’ parents were completely unreasonable, but the comic tries to show that they were at least partially in the right. They agree to a reasonable compromise of having a committee for the residents to help in important decisions. They could have merely asked for something like that instead of demanding it. The current King is very reasonable and he would have had no suggestions. I don’t like the way that they went about it so I can safely say that I’m not a fan of those two characters. Overall, This was a solid Sonic collection. The second half definitely has a lot of weak points, but it was still good overall. The first part was definitely a lot more exciting. The collection is a little lacking in the action department, but I’m confident that the next collection will change that. It’s time for the next big villain after all! I definitely recommend this collection to all Sonic fans. Their is a lot of dialogue, but it’s all pretty interesting since the writing is very good. I may not agree with the things that some of the characters say, but it’s not the fault of the writer’s. Some characters have to be the fall guy once in a while. At least we can be confident in the fact that Sonic will always be a solid character.